ON THIS PAGE: You will find some basic information about this disease and the parts of the body it may affect. This is the first page of Cancer.Net’s Guide to Chronic Myeloid Leukemia. Use the menu to see other pages. Think of that menu as a roadmap for this complete guide. Leukemia is a cancer of the blood. Leukemia begins when healthy blood cells change and grow out of control. Chronic myeloid leukemia (CML) is a cancer of the blood-forming cells, called myeloid cells, found in the bone marrow. 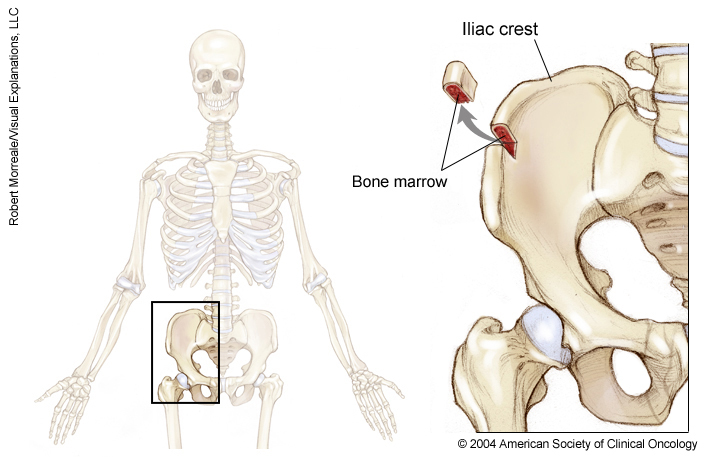 Bone marrow is the spongy, red tissue in the inner part of large bones. CML most often causes an increase in the number of white blood cells, such as neutrophils or granulocytes, that normally fight infection. It is also sometimes called chronic granulocytic, chronic myelocytic, or chronic myelogenous leukemia. People with CML have a genetic mutation or change in their bone marrow cells. It is called a translocation. A translocation is when part of a long strand of genes called a chromosome breaks off and reattaches to another chromosome. In CML, part of chromosome 9 breaks off and bonds to a section of chromosome 22, forming the Philadelphia chromosome or Ph chromosome. The Ph chromosome is made up of 2 genes called BCR and ABL that join together into a single fusion gene called BCR-ABL. It is found only in the blood-forming cells, not in other organs of the body. The BCR-ABL gene causes myeloid cells to make an abnormally activated enzyme. Specifically, it is a tyrosine kinase enzyme. This abnormally activated enzyme is called a fusion protein and allows white blood cells to grow out of control. This genetic change develops from damage that occurs by chance after a person is born. There is no risk that a person will pass on this gene to their children. Ordinarily, the number of white blood cells is tightly controlled by the body—more white blood cells are produced during infections or times of stress, but then the numbers return to normal when the infection is cured. In CML, the abnormal BCR-ABL enzyme is like a switch that is stuck in the “on” position—it keeps stimulating the white blood cells to grow and multiply. In addition to increased white blood cells, the number of blood platelets that help the blood to clot often increase. And, the number of red blood cells, which carry oxygen, may decrease. Cancer.Net Patient Education Video: View a short video led by an ASCO expert in CML that provides basic information and areas of research. Cancer.Net En Español: Read about CML in Spanish. Infórmase sobre leucemia mieloide crónica en español. The next section in this guide is Statistics. It helps explain the number of people who are diagnosed with CML and general survival rates. Use the menu to choose a different section to read in this guide.